Hello, from Trafalgar Square in the heart of London! This public area, which displays Nelson's Column, is a famous tourist landmark and its name commemorates the Battle of Trafalgar, a British naval victory over France led by the well-known Admiral, Horatio Nelson. Located on this square is The National Gallery, the building shown behind me. For all you Bond fans out there, here's a bit of trivia: this art museum was featured in the latest 007 film, Sky Fall, and was the meeting point of Bond and MI6's Quartermaster. Enough about history and movies, let's talk fashion! So what did I wear under my coat? I chose a red-black-white palette and paired a white blouse with a red skirt and black tights. 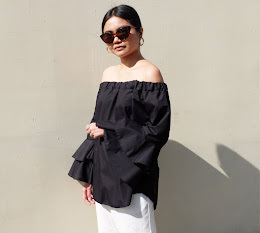 There are certain color combinations that I love wearing because they're classic and timeless and this particular combo is one of my favorites. 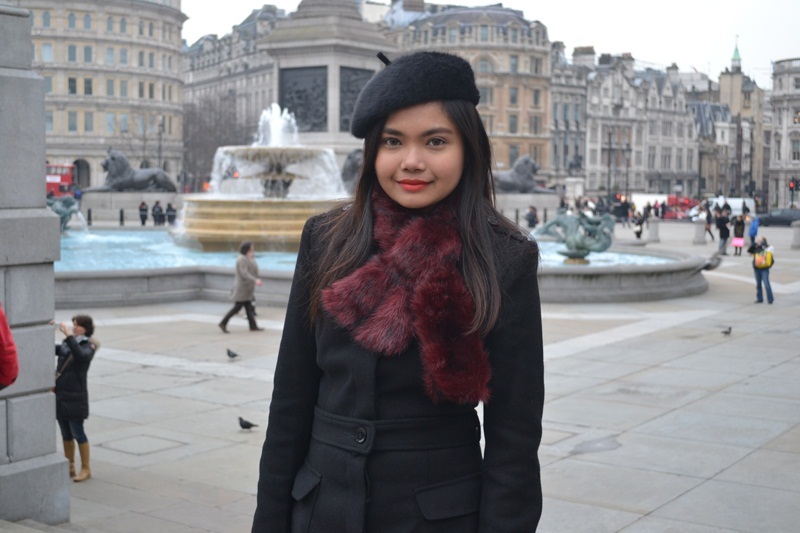 I added a dose of Parisian chic by wearing this little black beret. Not only was this a stylish accessory but also kept me warm while exploring the capital's busy streets. I wore my faux fur collar, which was a new purchase from Tie Rack, a British-based retailer that I discovered during my trip. One of my greatest surprises upon arriving in England was the weather. You cannot begin to comprehend the icy chill of the British winters until you have experienced it firsthand. Even though I had adjustments to do clothing-wise, I still enjoyed picking out winter-appropriate garments. It was certainly a refreshing change and a thrill for me. Love the scarf! :) I have a similar colored one and it's so versatile, I've warn it to death this Winter.